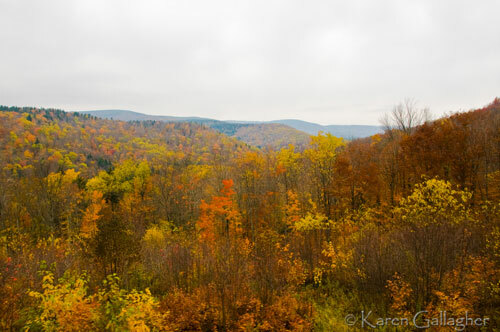 My husband and I have visited a lot of state parks, but never one so unique as Cass Scenic Railroad State Park. 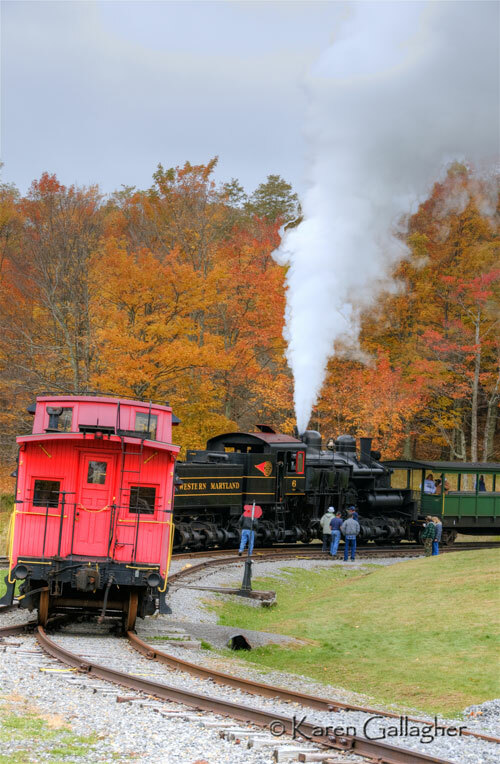 Hearing glowing reports of a ride on a steam-powered logging train up the third highest mountain in West Virginia during the peak of fall color piqued our curiosity. So, we made our way over winding mountain roads to the town of Cass where we spent the night camping in the depot’s parking lot. In the morning we secured tickets for the 4 1/2 hour ride to a stop in Whittaker and up Back Allegheny Mountain to the summit, Bald Knob. After a welcome breakfast of eggs, sausage, and biscuits we joined the gathering crowd to await the approach of our locomotive. A loud oscillating whistle and billows of steam announced the grand entrance of Shay locomotive # 6. Seats were first come, first serve. We found bench seats on one of the last open cars and soon we were on our way pushed up the mountain by the mighty piston pumping, black smoke belching, largest surviving Shay locomotive in the world. After following beautiful Leather Bark Creek, and negotiating switchbacks to gain altitude, we arrived at Whittaker. Climbing out to get a better look at our engine and a recreated 1940’s logging camp constructed by the Mountain State Railroad & Logging Historical Association we marveled at the well conceived historical site. You may be interested in photos on the historical association’s website showing the construction of the Whittaker logging camp. In this photo you can see that our engine is in the pushing rather than pulling position. 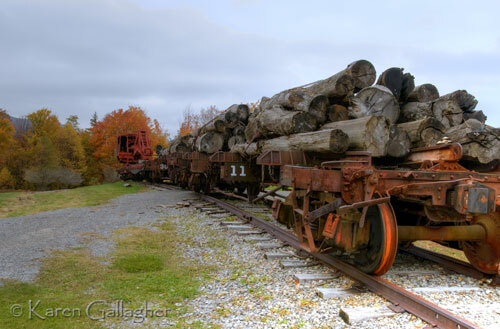 This photo shows two flatbed cars loaded with logs. In the background you can spot the Lidgerwood tower skidder that brought freshly cut logs out of the forest. 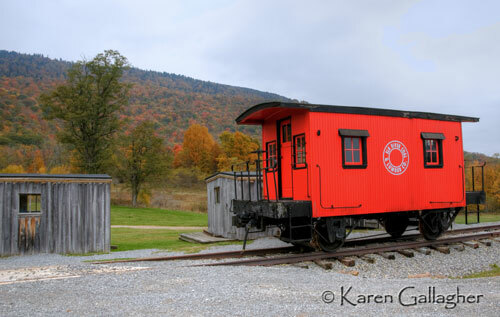 Of special note was the brightly colored caboose parked on a siding. After re-boarding, we continued up the mountain, amazed at the locomotives powerful pulsing as we mounted grades up to 11 %. On the way, we stopped at Oats Run to take on water from a spring. The tracks took us through beautiful hardwood forests rich with vibrant color until suddenly the forest changed to Spruce. That’s not all that changed–a cold front moved in bringing drizzling rain and fog. The temperature at 4,700 feet dropped to 37 degrees. We hadn’t dressed for those temperatures! 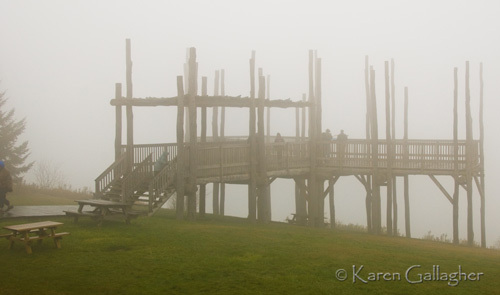 An observation platform was completely enshrouded in a misty cloud. 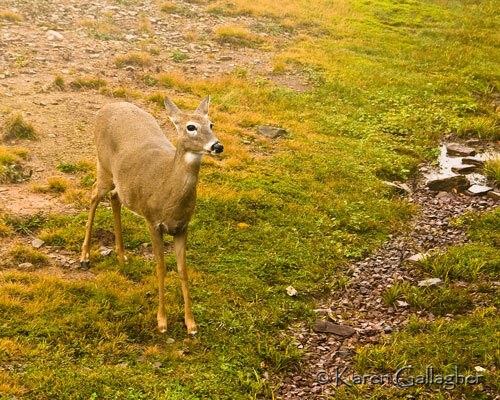 One creature who didn’t mind the cold, a hungry doe, approached the train looking for handouts. After a brief stop, we descended. Occasionally the fog would clear and give us glimpses of fall’s glory. Even though we felt cold and damp, the trip was worth every minute. We hope to go again someday. Logging at Cass stopped in 1960 and in 1963 the town of Cass and its railroad became a West Virginia State Park. The Park owns six Shay engines, a Climax, and a Heisler. All are geared locomotives designed with articulating trucks to navigate the hairpin turns on irregular tracks laid atop the ground. Direct gearing is provided to every wheel. 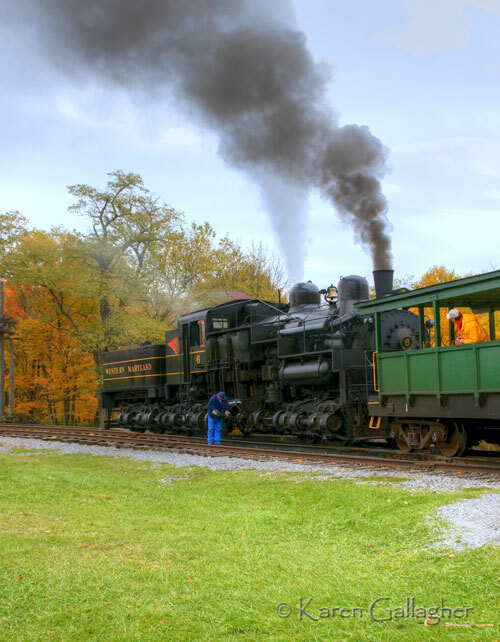 Our Shay engine was built for the Western Maryland Railway Company. 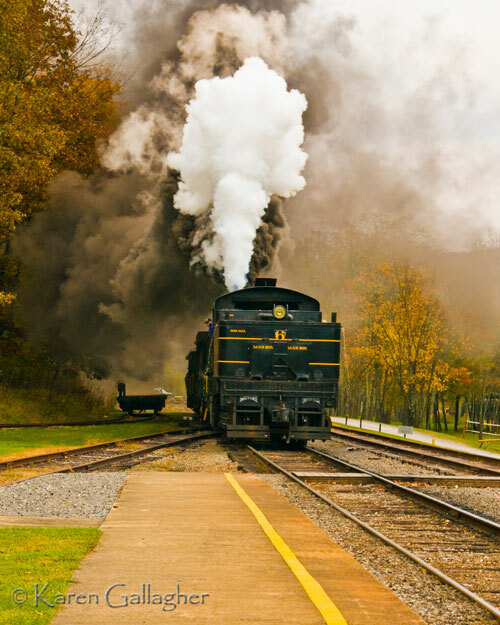 Redeemed from the Baltimore & Ohio Museum, the Cass Scenic Railroad acquired it in 1980. 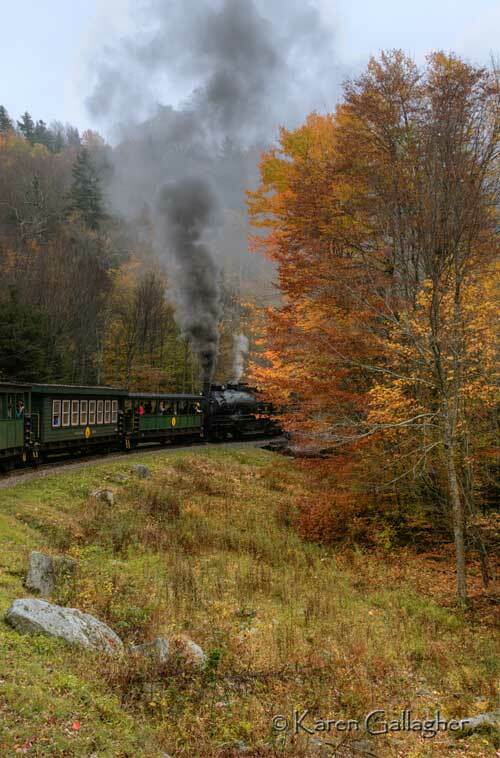 You must experience a ride on the Cass Scenic Railroad to appreciate the incredible power of this 162 ton locomotive. 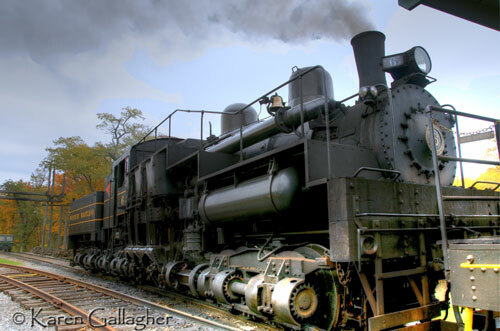 There is nothing like the pulsating push of this enormous workhorse as coal black smoke chugs from its smokestack or the mighty pssssst of rolling white steam as it discharges from the pressure-relief valve. If you haven’t discovered the romance of railroading, then this is one experience you should seek. It might even turn you into a railroad aficionado. Thanks for sharing your incredible joy ‘romance of railroading’. Thanks for the railroad trip. Your image “Shay locomotive # 6” is incredible. The lines, smoke and steam gives so much life to the image. It reminds me of the steam trains when I was a (younger) boy. Carsten, I sincerely appreciate your comment. The first photo is my favorite, too. There was such excitement in the crowd when the engine appeared. I wanted to capture the full effect of its power. I’ve seen other shots of older locomotives. The steam these trains bill out our so very photogenic as you’ve shown here. Thanks for sharing. I did a ride up Pike’s Peak once on a train and didn’t prepare for the cold weather at the summit either. Pike’s Peak–what a ride that must have been! I understand that the elevation is over 14,000 feet. You must have been quite cold. Thank you for sharing about your trip and showing us the incredible pictures! I would have loved to be with you…I MUST go on this train someday soon! I’m sure Uncle Arvid wishes he could have been with you too! Your pictures are STUNNING!!!! What a beautiful journey life is – what blessings we have been given. Thank you for sharing your blessings with us – it truly is lovely and heartwarming. BKM, life is truly a beautiful journey. Like any journey it has its challenges, but they are often blessings in disguise. My thanks to you for looking at my blog and for taking the time to comment. Beautiful work, Karen! The Cass Scenic is an amazing, American treasure, and preserving those old Shays for future generations is a wonderful thing. Thank you so much for your comment, Don. You are right; the Cass Scenic is truly an American treasure. The thrill of being pushed by that mighty engine is an experience I will never forget.